Periodic trail status updates are posted here. If you have updates you would like to share with others, email them to info@nvatvc.org. Volunteers spent 8 hours grooming today. More volunteers will be on the trails tomorrow to finish grooming the main loop. The whole loop was groomed today and volunteers report the trails are in good shape. Volunteers had the groomers out again today and report that all trails are passable and trails are in good condition. NVATVC wardens were present on all trails today. They report the trails are muddy, but passable. Trees fallen in the recent windstorms have been cleared. 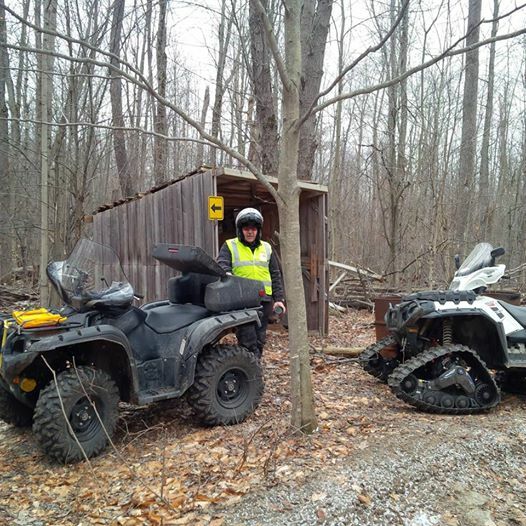 Trespassing on closed trails leads to trail closures and hurts all ATV enthusiasts. 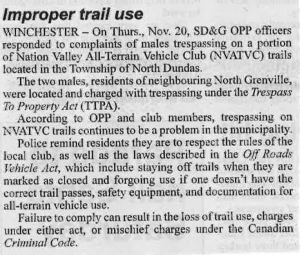 Please obey the rules and report trespassers to ensure we continue to have trails available to ride in the future. Following the high winds last night, please be aware that there is likely debris and trees down blocking some trails. Club volunteers will hopefully be out this weekend to ensure the trails are open. If you encounter debris you aren’t able to remove, please send an email to trails@nvatvc.org with details about the obstacle and the location so we can have our volunteers take care of it. Wardens report that trails are unseasonably wet. Typically trails are dry and rides are fast and easy at this time of year. 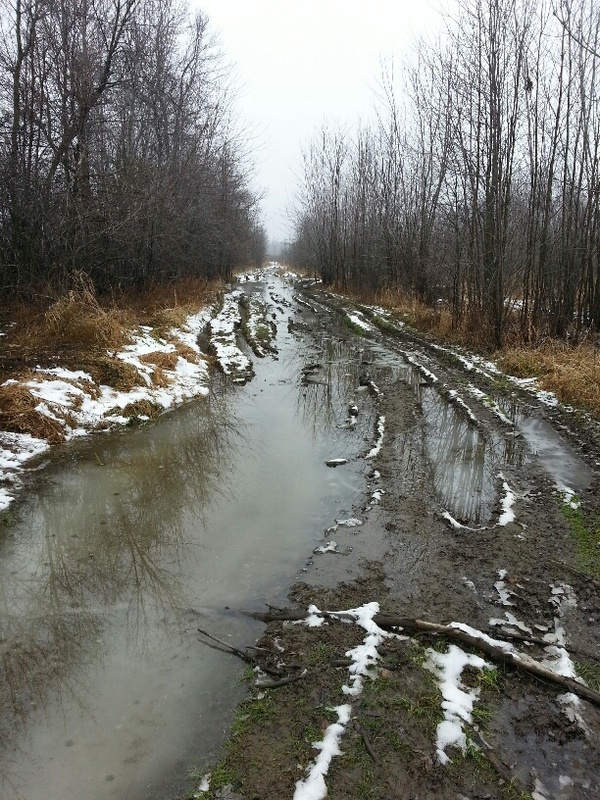 With the wet summer we’ve had, the trails are currently wet and muddy. Ice is beginning to form, but is not strong enough to support ATVs yet. Please ride carefully, stay dry and stay warm. With the last day of gun hunting for deer over, the trails have reopened. Today we got out first accumulation of snow. Rest assured that club volunteers are busy preparing the grooming equipment for another busy year of winter trail riding. 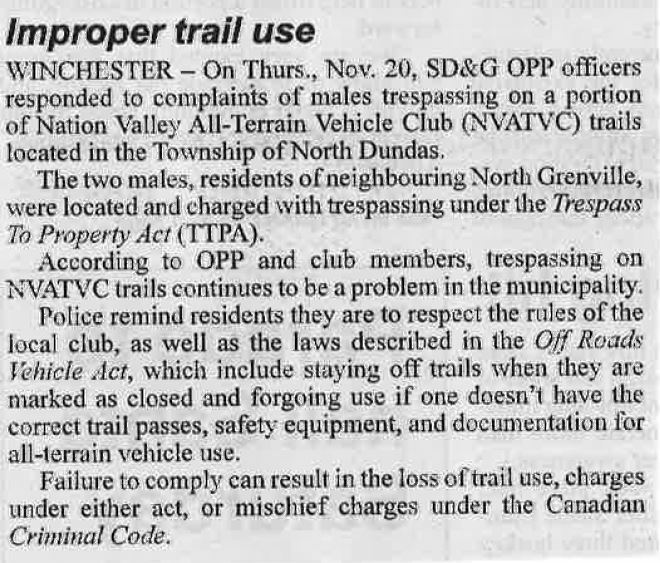 All Nation Valley ATV Club trails are closed for two weeks during deer hunting. Many of our trails are on private property where land owners hunt deer for two weeks each fall. 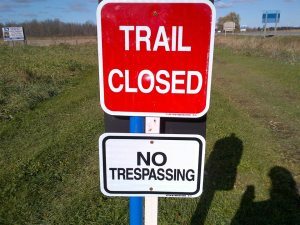 To respect our generous land owners, and for your safety, please obay the trail closures. Trails will open again on November 17th.